Precious stones are generally the most costly of stones used in jewelry. Traditionally, the four precious stones are diamond, emerald, ruby and sapphire. All other stones may actually exceed the value of inferior precious stones. Stones to be used in jewelry are considered semiprecious stones. These are found in nature. The scarcity and high price of precious stones have been an incentive for the manufacturing of synthetic stones. Most synthetic stones are formed by fusing the same chemicals as those that compose natural stones by means of the intense heat in an oxygen and hydrogen flame. Though manufactured, they are principally the same as natural stones since they contain the same chemicals and possess identical physical properties; that is, they’re just as hard and have practically the same specific gravity (SG) and refractive index. Under a microscope, synthetic stones can be distinguished from the natural by slight uneven distribution of color, structure lines and the presence of air bubbles. Imitation stones are typically manufactured from glass or plastic. They are comparatively inexpensive and can be easily detected by means of a file since they can be filed whereas most stones cannot. Doublets are two pieces of stone glued together with an invisible cement, thus appearing more expensive. They usually consist of a natural gemstone crown atop a pavilion of cheaper material, typically glass, glued together at the girdle to make detection difficult. Similarly, triplets are three materials combined, most commonly found in cabochon form. Rubies, garnets, opals and diamonds are common materials used for doublets and triplets. 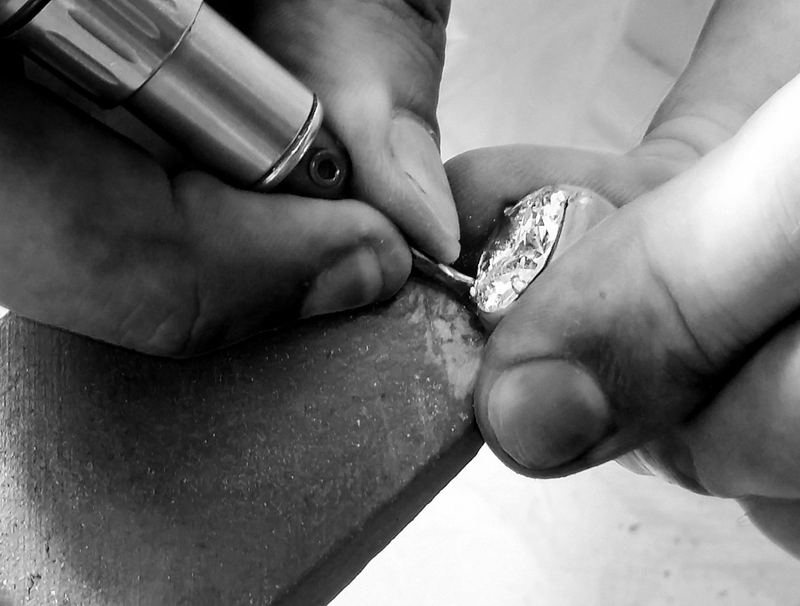 Carat (ct) is a unit of weight, used generally for faceted precious stones and transparent semiprecious stones. The Mohs hardness scale, devised by German mineralogist Friedrich Mohs, is based on the ability of one stone to be scratched by another. Because the scale indicates approximate relative hardness of different stones, the steps do not scale regularly. The specific gravity is a ratio: the weight of a material (gemstone) to the weight of an equal volume of pure water in standard pressure at 4°C (at this temperature, 1cm³ of water = 1 gram; its specific gravity is therefore 1). “Cabochon”, derived from French caboche “head”, describes a domed, typically unfaceted stone commonly found in jewelry. In fact, most early examples of stone-set jewelry feature this variety of cut. The cabochon shape remains popular today, typically for translucent and opaque semiprecious stones and, occasionally, for transparent and precious stones as well. The surface of a faceted stone is comprised of intersecting flat planes, arranged systematically according to the material’s refractive index and crystal structure. Such a cut is usually applied to transparent stones of high refractive index, but opaque stones, such as spinel, may feature facets too. The prime function of facets is to exploit the optical properties of its material, increasing its apparent brilliance (luminescence) and dispersing light (an effect called “fire”), both of which enhance any existing color.